Blend of high-purity powdered potassium, an important component of aragonite (the mineral secreted as skeletal material by corals and other reef-building marine organisms), complexed into pigments that enhance blue coloration of some small-polyp stony corals, important to proper neurological function, and depleted in marine aquaria by livestock. May be used to combat potassium depletion that often accompanies the use of zeolite-based filtration methods employed to maintain ultra-low-nutrient aquaria. 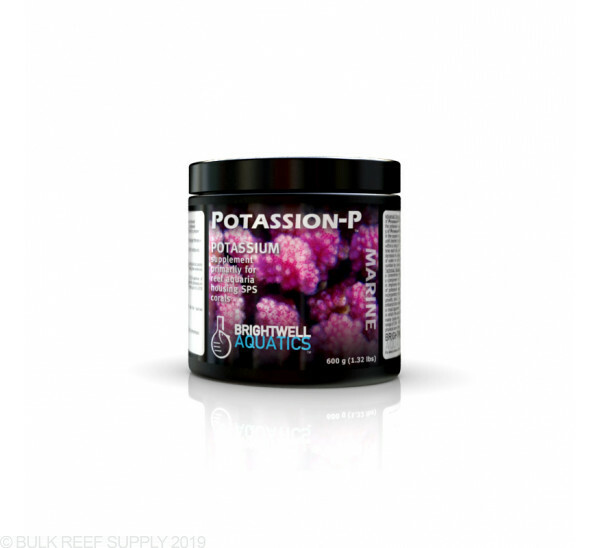 Considerably stronger and more economical than liquid potassium solutions; created for hobbyists maintaining multiple reef aquaria. Dissolve 2 grams (~½ teaspoon) of product per 20 US-gallons of aquarium water in 8-fl. oz. of fresh water; add every other day or as needed to maintain the potassium concentration within a range of 390 - 410 ppm. When used in this fashion, 1,200 g treats up to 12,000 US-gallons (45,425 L). 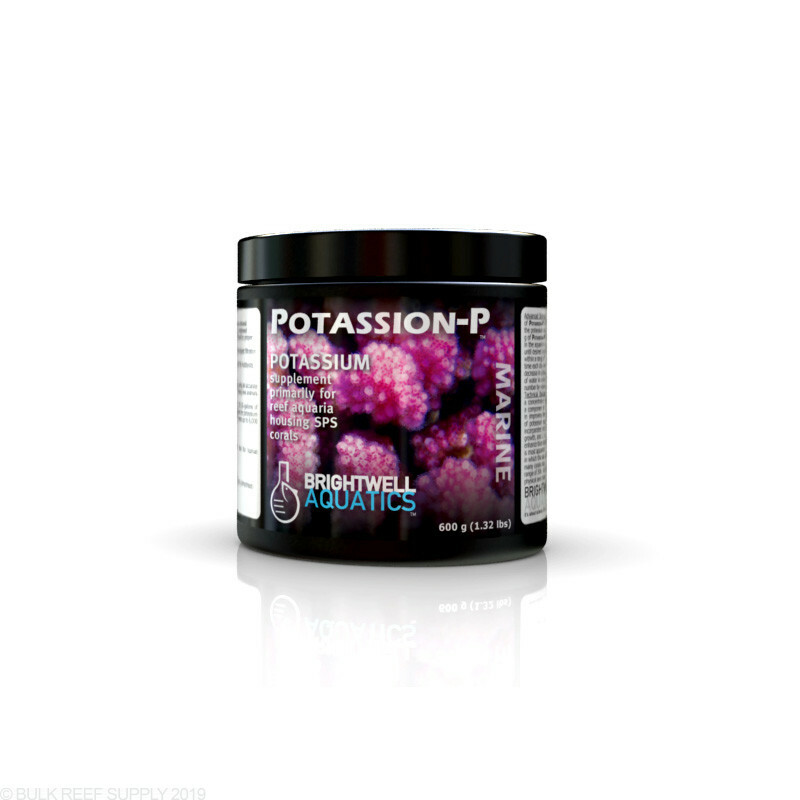 Create a stock solution by dissolving 5 grams (~2 teaspoons) of Potassion-P in 8-fl. oz. of fresh water (preferably purified); each ml of the solution will increase the potassium concentration (“[K+]”) in 1 US-gallon (3.785 L) of water by 1.7 ppm. [Reference: Each g of Potassion-P will increase the [K+] in 1 US-gallon (3.785 L) of water by ~129 ppm.] If initial [K+] in the aquarium is below 399 ppm, add stock sol’n at maximum rate of 10 ml per 20 US-gallons daily until desired concentration is attained, then dose daily or weekly as needed (see below). Maintain [K+] within a range of +/-10 ppm. Once desired [K+] has been acquired, measure aquarium's [K+] at the same time each day over a one- to two-week period to determine the daily rate of potassium uptake (i.e. the decrease in potassium). To determine daily dosing rate (preferable to weekly dosing): estimate volume of water in entire aquarium system (US-gal. ); divide the daily decrease in [K+] by 1.7; multiply this number by volume of water in system to obtain daily ml of stock sol’n required to maintain stable [K+].